Hyper Light Drifter is a 2D top-down action-adventure game with challenging combat, and a memorable, dream-like atmosphere, accomplished through its cool color palette, ambient music, and successful omission of written or spoken dialogue. It has been available for PC, OS X, Linux, PlayStation 4, and Xbox One since 2016. It stands out as one of the best-looking games to be developed in the 2D-centric GameMaker Studio. A lot of other games today are made with Unity, which means they use a lot of 3D tricks, even if they appear to be 2D to the player. These games, of course, end up having some 3D elements, or many 2D ones, which aren’t necessarily pixel art. In this way, Hyper Light Drifter is like an evolved retro game. It’s 2D, but it has the controls, sound, and developed presentation of a game that could only have come after years of outstanding 2D and 3D retro games before it. I think it’s similar to the situation which surrounded some of the best 2D games on the original PlayStation: Alundra, and Castlevania: Symphony of the Night. It was a time when players were asking for 3D games, but because these two games came later and took advantage of newer hardware, they had some of the best visuals and gameplay for their time. 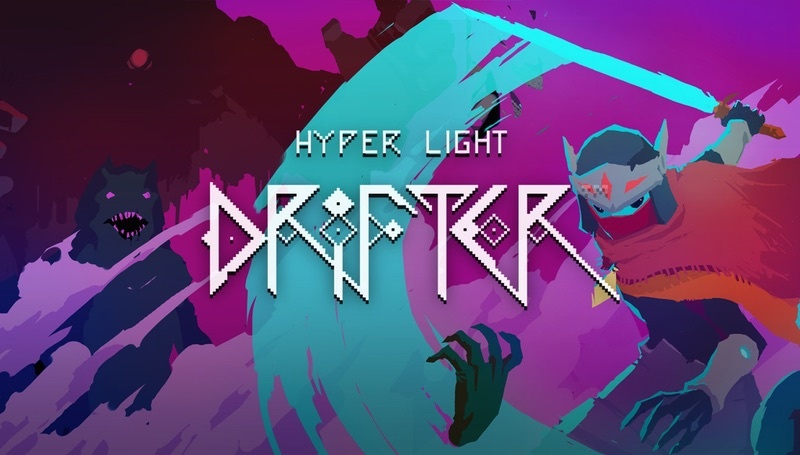 Similarly, Hyper Light Drifter is a throwback to retro games, and then some. You play as a mysterious cloaked character with some unknown illness, equipped with a sword and a gun. The environment has the appearance of some techno-ruins, which have been overtaken by vegetation. You dash around and slash enemies and breakable objects in the environment, which has the added benefit of charging your gun. You can use your gun by holding the ZL button, aiming in your intended direction with the left stick, and firing with the ZR button. When playing, I often encountered a room or area where I would fight a wave of enemies all at once. These kill rooms can be dangerous places with all of the enemies trying to attack me all at once. My strategy was to whittle down each group of bad guys one at a time while avoiding incoming attacks. Luckily the enemies give some indication about how they’re going to attack, so combat in this game is like a dance, or sometimes a bull-fight, where you dash toward and away from enemies, hitting them with a small combination of melee attacks when there’s an opening. One room took more than a half hour for me to clear because there were so many enemies and I had to play near-perfectly to survive. Fortunately, whenever I was defeated, I was placed right back at the start of the room to try again. As soon as I discovered I could take out smaller enemies from afar with my gun between rounds of sword slashing, I found a pace that got me through that room quickly. There’s some comparison to the Super Nintendo classic, The Legend of Zelda: A Link to the Past, but the combat and presentation stand out to give this game a much different feel. It’s not possible to run right into a group of enemies in this game and defeat them so easily as it might be in similar games, like I mentioned, because avoiding attacks by dashing is just as important as using the sword and gun in combination. It’s a lot like in Final Fantasy XIV: A Real Reborn, where an area surrounding an enemy will light up, and you have to remove yourself from the line of attack, or be defeated quickly. When you speak to non-playable characters in the game, instead of a speech bubble or dialogue, they speak with a picture or series of pictures, which illustrate some story about something that has happened to them. The result is that the game is a little ambiguous with its story, but there are clear hints that pop up on the screen about how to play the game and sometimes how to advance. For example, I was slashing many objects, when I was notified by a clear message in the game display that my gun was now fully charged from slashing objects. There are portals in the game for moving around the map, which, like the gun, are also clearly explained in the game. The graphics in Hyper Light Drifter are outstanding. I’m not an artist, but I think the colors in the game get along very well. There’s a lot of purple, maroon, and teal, and every other color seems to mix well with the three of them. Even though it features a top-down perspective, the backgrounds are drawn in such a way that they create noticeable depth. You will find the remains of giants, ruins, and other areas visible at many different distances in the backgrounds while fireflies, falling snow, and other ambient particles dance around in the foreground. The characters and enemies are all beautiful, pixel-based sprites, and there are plenty of large 2D illustrations and animations in the cut-scenes and picture-dialogues throughout the game. The game does run at 60 frames-per-second, but I can only testify that it runs faster than 30. More 2D games should look like this! I would say that the sound is good. The music is ambient and mysterious, like the graphics and overall presentation of the game, but I found myself turning the volume up, then down, again and again, because there seems to be a relatively large difference in volume between the most and least quiet parts of the soundtrack. It’s unfortunate, because the music itself is great. I think that if you like a mix of melee and ranged combat, pixel art, or retro-style games, you’ll enjoy Hyper Light Drifter. The are some new features in this special edition, including a “Tower Climb challenge” for those that may have already played through the game elsewhere. I had an excellent time throughout and I implore Nintendo Switch owners to check it out! Hyper Light Drifter – Special Edition is one of the best independent games on the Nintendo eShop and a shining example of 2D gaming in general. It’s a retro-style game and then some, with great atmosphere and challenging combat. If you missed it on other platforms, now’s your chance! Hyper Light Drifter – Special Edition was reviewed using a final retail Nintendo Switch download code provided by the publisher. Adam “McSNES” Martinez, gaming drop-out and FuncoLand ghost, has spent his entire life training to review games for YOU, the loyal readers of Nintendo Times. Adam is permanently banned from Final Fantasy XI: Online, his favorite game.